Attention horror movie and horror story fans and anti-remakes advocates: Mortimer A. London is back from the dead! 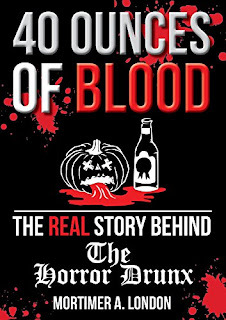 40 Ounces of Blood: The Real Story Behind The Horror Drunx is written by none other than The Horror Drunx creator, Mortimer A. London about his true account of the creation, history and events which took place during the height of The Horror Drunx’s popularity. The book also contains loads of event photos and images of The Horror Drunx Chapters (a bonus for all The Horror Drunx members) across America and the globe, including a chapter on The Horror Drunx Manifesto in its full, unedited glory. Find out how it all began and why The Horror Drunx became a full-blown phenomenon, which revolutionized the horror movie industry and caused a stir among film sequels and film remakes with its “Boycott Remakes” credo and campaign.